3-John Joseph Hone Maclaine was born on 30 Dec 1833 in Spring Bay, Tasmania, was christened on 7 Feb 1844 in County of Buckingham, Tasmania, and died on 25 Jan 1909 at home, Woodstock, Lilydale, Tasmania at age 75. John married Emily Anne Salier, daughter of George Salier and Ann Georgiana Bush, on 18 Oct 1870 in the home of brides parents, Melbourne Lodge, Elizabeth Street, Hobart. Emily was born on 7 Aug 1843 in Hobart, Tasmania and died on 28 Feb 1897 in Clarke Island, Bass Strait, Tasmania at age 53. 4-Florence Frances Aubin Maclaine was born on 24 Sep 1871 in Clarke Island, Bass Strait, Tasmania, was christened on 24 Sep 1871 in Launceston, Tasmania, and died on 19 Nov 1941 in Campbell Town, Tasmania at age 70. Florence married John Richard Abel, son of John Bartle Freeman Abel and Sophia Triffitt, on 15 Feb 1897 in St Leonards, Launceston. John was born on 19 Dec 1851 in New Norfolk, Tasmania and died on 26 Sep 1917 in Newstead, Launceston, Tasmania at age 65. They had six children: Dorothy, John Noel Maclaine, Lorna Frances, Greta Ricardia, Richard Garth and Mollie Allison. 5-Dorothy Abel. Dorothy married R. H. Bayles. 5-John Noel Maclaine Abel was born on 25 Dec 1899 in 155 George Street, Launceston. 5-Lorna Frances Abel was born on 31 May 1901 in 155 George Street, Launceston and died before 1941. 5-Greta Ricardia Abel was born on 24 Nov 1903 in 11 Elphin Road, Launceston. Greta married E. C. Sims. 5-Richard Garth Abel was born on 22 Mar 1905 in 11 Elphin Road, Launceston. 5-Mollie Allison Abel was born on 27 May 1910 in Newstead, Launceston, Tasmania. Mollie had a son: Peter. 4-Frances Harriet Mary Maclaine was born on 18 Jan 1873 in George Town, Tasmania and died on 20 Oct 1902 in 38 Elizabeth St. Launceston, Tasmania at age 29. Frances Harriet Mary Maclaine married John Procter. 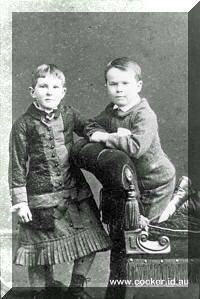 Frances and her brother Hugh about 1881. 4-Margaret Maria Maclaine was born on 19 Mar 1874 in Clarke Island, Bass Strait, Tasmania and died in 1957 at age 83. 4-Hugh Donald Butler Maclaine was born on 26 Apr 1875 in Clarke Island, Bass Strait, Tasmania, was christened on 26 Apr 1875 in Launceston, Tasmania, and died in 1944 in Dawson City, Yukon, Canada at age 69. 4-George Salier Maclaine was born on 15 Apr 1876 in Clarke Island, Bass Strait, Tasmania and died on 3 Aug 1961 in Launceston, Tasmania at age 85. George married Jessie Cooper on 26 Jun 1915 in Long Island, Bass Strait. Jessie was born in Cheshire, England. They had five children: Kenneth Alister, Alan Grantham, George Salier, Grantham Stanhope and Malcolm Hugh. 5-Kenneth Alister Maclaine. He served in the Second World War as an AAES Signaller. Kenneth married Val Hamilton. They had two children: Glenda and Ian. 5-Alan Grantham Maclaine was born on 28 Jun 1916 in 62 Frederick Street, Launceston, Tasmania. Alan married Judy Nancy Amos on 28 Aug 1954 in St Johns Church, Launceston. They had three children: Ross, Peter and Keith. 5-George Salier Maclaine was born on 22 May 1919 in 4 Church Steet, Launceston, Tasmania. George married Betty Douglas-Hamilton in May 1951 in St Georges Anglican Chuch, Battery Point. They had five children: Heather, Anne, Quentin, Grant and Cynthia. 5-Malcolm Hugh Maclaine was born on 10 Feb 1925 in Scottsdale, Tasmania and died on 26 Nov 1994 in Launceston, Tasmania at age 69. He served in the Second World War. Private Malcolm Maclaine has been awarded the Commander-in-chiefs Merit Card for Distinguished Service In the S-W. Pacific Area during 1944 Pte. Maclaine is a son of Mrs. H. G. Sailer, Scottsdale. Malcolm married Betty Jean Brown on 30 Oct 1947 in St. John's Church of England, Launceston. Betty was born on 13 May 1926 and died in 1994 in Launceston, Tasmania at age 68. They had two children: Heather Rohan and Quentin Hugh. 6-Heather Rohan Maclaine was born on 25 Jun 1948 in Queen Victoria Maternity Hospital, Launceston. 6-Quentin Hugh Maclaine was born on 12 Mar 1952 in Queen Victoria Maternity Hospital, Launceston. 4-Emily Mona Maclaine was born on 8 Jul 1877 in Clarke Island, Bass Strait, Tasmania and died in 1939 at age 62. 4-John Duart Maclaine was born on 8 Jul 1877 in Clarke Island, Bass Strait, Tasmania and died on 16 May 1947 in Launceston General Hospital, Launceston, Tasmania at age 69. John married Madge Lucadou-Wells, daughter of Algernon Lucadou-Wells and Sarah Jane Cogger, on 7 Aug 1913 in Holy Trinity Church, Launceston, Tasmania. Madge was born on 14 Apr 1885 in Launceston, Tasmania and died on 26 Jul 1943 in the Launceston General Hospital at age 58. They had four children: John Donald, Harry Douglas, Estelle Deirdre and Hugh Algernon. 5-John Donald Maclaine was born on 18 May 1918 in Clarke Island, Bass Strait, Tasmania and died on 26 Dec 1978 in Hobart, Tasmania at age 60. John married Mavis Edith Harvey, daughter of Percy Alexander Harvey and Lillie Isabel McHugh, on 27 Dec 1944 in Launceston, Tasmania. Mavis was born on 3 Jul 1925 in Launceston, Tasmania, died on 7 Nov 2006 in Philip Oakden Hospice, Launceston at age 81, and was buried on 13 Nov 2006 in Cremated after service at Pilgrim United Church, Launceston. They had five children: Helen Mary, Elizabeth Anne, Jillian Margaret, Catriona and John Leslie Duart. 6-Helen Mary Maclaine was born on 25 Oct 1946 in St Ives Private Hospital, Launceston. 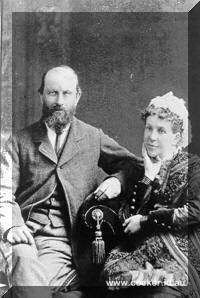 Helen married David Rhys Stephen. David was born on 20 Nov 1940. They had two children: Sarah Elizabeth and Nicholas Rhys. 7-Sarah Elizabeth Stephen was born on 18 Oct 1972 in Hobart, Tasmania. 7-Nicholas Rhys Stephen was born on 28 Nov 1975 in Hobart, Tasmania. Nicholas married Olivia Margaret Sinnitt on 2 Jan 2005 in Caloundra, Queensland. Olivia was born on 17 Dec 1976 in Hobart, Tasmania. 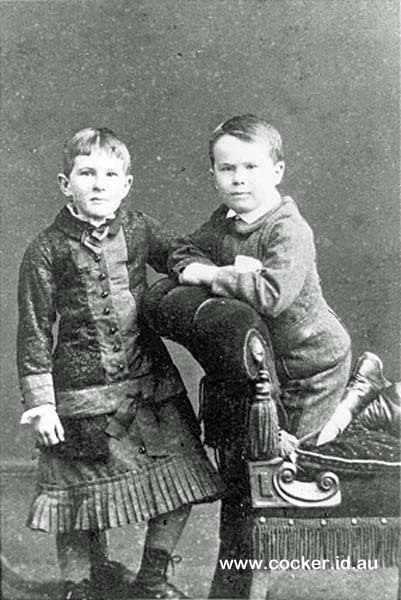 They had two children: Cooper Rhys and Parker William. 8-Cooper Rhys Stephen was born on 25 Feb 2006 in Hobart, Tasmania. 8-Parker William Stephen was born on 18 Aug 2008 in Hobart, Tasmania. 6-Elizabeth Anne Maclaine was born on 30 Jan 1949 in St Ives Private Hospital, Launceston and died on 14 Mar 1950 in Launceston, Tasmania at age 1. 6-Jillian Margaret Maclaine was born on 18 Dec 1951 in Launceston, Tasmania. Jillian married Ray Kelly. Ray was born on 8 Jan 1926. They had three children: Donald Raymond, Heather Jillian and Andrew Frederick. 7-Donald Raymond Kelly was born on 14 Jan 1976 in Launceston, Tasmania. 7-Heather Jillian Kelly was born on 11 Feb 1981 in Launceston, Tasmania. 7-Andrew Frederick Kelly was born on 7 Jul 1983 in Launceston, Tasmania. Andrew had a relationship with Kim Beasey. They had a daughter: Lillian Edith. 8-Lillian Edith Kelly was born on 20 Mar 2008 in Launceston, Tasmania. 6-Catriona Maclaine was born on 24 Oct 1955 in Launceston, Tasmania. Another name for Catriona is Cathleen Ruth (Cathie) Maclaine. Catriona married Gregory Buckley. Gregory was born on 6 Dec 1952. They had three children: Benjamin Moses, Hayley Pearl and James Zaccariah George. 7-James Zaccariah George Buckley was born on 16 Jan 1982. Catriona next married Colin Berry in 2001. 6-John Leslie Duart Maclaine was born on 20 Sep 1960 in Launceston, Tasmania. 5-Harry Douglas Maclaine was born on 12 Dec 1920 and died on 22 Aug 1986 in Midland Highway, Epping at age 65. Harry married Corrie Isabel Harvey, daughter of Percy Alexander Harvey and Lillie Isabel McHugh, on 1 Jan 1942 in Launceston, Tasmania. Corrie was born on 13 May 1923 in Launceston, Tasmania and died on 8 Aug 1964 in Ulverstone, Tasmania at age 41. They had five children: Denis John, James Duart, Jeanette Coral, Kevin Grant and Margaret Annemarie. 6-Denis John Maclaine was born on 31 Mar 1945 in St Ives Private Hospital, Launceston. Denis married Claire Townsley, daughter of Wilfred Asquith Townsley and Louisa Keay. Claire was born on 22 Aug 1946 in Hobart, Tasmania. They had three children: Genevieve Alice, Ivan Alexander and Katrina Louise. 7-Genevieve Alice Maclaine was born on 5 Aug 1973 in Hobart, Tasmania. Genevieve married Patrick Michael O'Sullivan, son of Niall O'Sullivan and Faye (O'sullivan), on 1 Sep 2001. Patrick was born in 1965 in Saigon, Vietnam. They had one daughter: Elise Claire. 8-Elise Claire O'Sullivan was born on 3 Sep 2002 in Brisbane, Queensland. 7-Ivan Alexander Maclaine was born on 17 Mar 1976 in Hobart, Tasmania. 7-Katrina Louise Maclaine was born on 4 Apr 1979 in Hobart, Tasmania. 6-James Duart Maclaine was born on 2 Jul 1945 in St Ives Private Hospital, Launceston. James married Gael Kirkland. Gael was born on 4 Jul 1946. They had four children: Ben, Lachlan, Anna and Laura. 7-Ben Maclaine was born on 18 Jun 1971. 7-Lachlan Maclaine was born on 20 Jan 1978. 7-Anna Maclaine was born on 13 Nov 1979. 7-Laura Maclaine was born on 25 Jun 1983. 6-Jeanette Coral Maclaine was born on 29 Jan 1947 in Queen Alexandra Hospital Hobart, Tasmania. Jeanette married Brian Robert Collin. Brian was born on 29 Sep 1931. They had two children: Peter John and Sandra Jane. 7-Peter John Collin was born on 13 Jan 1969 in Hobart, Tasmania. 7-Sandra Jane Collin was born on 4 May 1971. Sandra married Stephen Mattingley. 6-Kevin Grant Maclaine was born on 23 Sep 1952 in Devon Hospital, Latrobe and died on 26 Jan 1976 in Sydney, New South Wales at age 23. 6-Margaret Annemarie Maclaine was born on 15 Sep 1958 in Hobart, Tasmania. Margaret married Alan Richard Park. Alan was born on 31 Aug 1940 in Hobart, Tasmania. They had two children: Daniel James and Michael Bennett. 7-Daniel James Park was born on 11 Feb 1983 in Hobart, Tasmania. 7-Michael Bennett Park was born on 11 Jun 1985 in Hobart, Tasmania. 5-Estelle Deirdre Maclaine. Estelle married Robert Leslie Green. Robert was born about 1919 and died on 30 Oct 1965 in Daw Park, Adelaide, South Australia aged about 46. They had three children: Malcolm, Meredith and David. 6-David Green was born on 8 Jul 1954 in Memorial Hospital, Adelaide. 5-Hugh Algernon Maclaine. Another name for Hugh is Ron. Hugh married Ruth Bayley on 24 Apr 1944 in Newtown, New South Wales. They had five children: Bill, Neil, Paul, Veronica and Leona Ruth. 6-Leona Ruth Maclaine was born on 9 Aug 1950 in Queen Victoria Maternity Hospital, Launceston. 4-Archibald Alan Maclaine was born on 2 Jan 1880 in George Town, Tasmania and died on 10 Jul 1954 in His home, Hilton Road, Claremont, at age 74. Archibald married Madge Marguerite Reid, daughter of Arthur Robert Reid and Margaret Ellen Webster, on 3 Jun 1929 in St Andrews Presbyterian Church, Hobart. Madge was born on 13 Sep 1899 in Hobart, Tasmania. They had two children: Rosemary Marguerite Helen and Angus Robert Archibald. 5-Angus Robert Archibald Maclaine was born on 6 Nov 1932 in Queen Alexandra Hospital, Hobart. 4-Ruby Maclaine was born in 1882 and died on 19 Feb 1943 in Payneham, Norwood, South Australia at age 61. Ruby married Archibald Edmond Gough, son of Archibald Edward Gough and Amelia Louisa Leupolt, on 3 Jun 1913 in Franklin Village. Archibald was born on 16 Mar 1883 in Aylsham Norfolk, England and died on 5 Mar 1970 in Norwood, South Australia at age 86. They had four children: Irene Mona, Archibald, Geoffrey and John. 5-Irene Mona Gough was born on 16 Apr 1917 in Tatura, Victoria and died in Wallaroo, South Australia. Irene married Dennis Royston Hall. Dennis was born on 18 Jun 1914 in Tea Tree Gully, South Australia and died in Katherine, Northern Territory, Australia.